I just love this card. 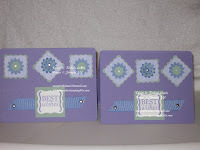 I used several of Stampin' Up! 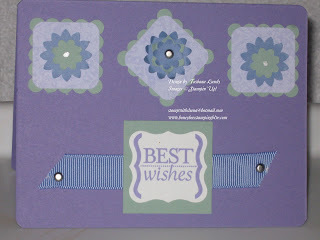 punches to create this Best Wishes card. I used the scalloped square, 1 1/4 square, Boho Blossoms, corner rounder, and the Curly Label Punch Bundle. I also used some silver brads and Brocade Blue ribbon. The card stock I used is Lovely Lilac, Whisper White, DSP, and Sage Shadow.